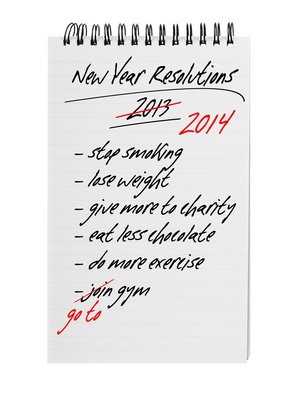 New Year’s Day brings with it the tradition of setting New Year’s resolutions. These resolutions typically entail setting goals like getting in better shape and losing weight, eating healthier, procrastinating less, or making more money. Of course, there is nothing wrong with setting goals and trying to make changes in our lives. But as many of us can attest, by the second week of January, new exercise equipment languishes in the corner of the basement, we’re back to eating junk food, and we’e fallen back into the habits in which we’ve always engaged. Frequently, the problem in following through on resolutions lies not with the goals that we set but with our approach to achieving them. A common approach is to set a very regimented plan on January 1st, giving little leeway for error or “slippage.” The first week goes great, we’re following our plan exactly. We’re eating well and exercising, getting things done as they come up, and being fiscally responsible. But then something happens: Life. We or a member of our family gets sick, we oversleep and don’t have time to make a healthy breakfast or get to the gym, or fun social opportunities arise. Again, it is not attending to these other demands that lead our resolutions to fall by the wayside. Instead, it is how we respond to our slips. A typical response is to be self-critical, pressuring ourselves to redouble our efforts and to right the ship. And we often do, at least for a few days, maybe even a couple weeks. But then the same things happen and we get derailed. And through applying pressure to ourselves again, we become stressed at not only having yet one more obligation to fulfill, but we also stress ourselves by being so self-critical. Now, stress can be beneficial at times. It helps to energize and motivate us, to get active and get things done. Too little stress and we become dormant. Too much stress and we become overwhelmed, paralyzed into inactivity. This is what happens when we set our resolutions too rigidly and criticize or pressure ourselves. Our intention of being strict with ourselves, setting goals, and attempting to achieve them through being tough on ourselves backfires. We go another eleven months before making the same resolutions the next year only to repeat the cycle. I will be less self-critical in the New Year. I will allow myself to be human and to make mistakes. I will be more gentle with myself in the New Year. I will be encouraging to myself, even when I make mistakes, rather than pressure myself. I hope that you have a happy and healthy New Year. David Prybock, Ph.D. is a therapist in the Shadyside area of Pittsburgh. He works with clients to help them achieve their goals of living happier, more fulfilling lives. This entry was posted in General Interest . Bookmark the permalink.